1. Answer A. If a chest drainage system is disconnected, the nurse may place the end of the chest tube in a container of sterile saline or water to prevent air from entering the chest tube, thereby preventing negative respiratory pressure. The nurse should apply an occlusive dressing if the chest tube is pulled out — not if the system is disconnected. The nurse shouldn’t clamp the chest tube because clamping increases the risk of tension pneumothorax. The nurse should tape the chest tube securely to prevent it from being disconnected, rather than taping it after it has been disconnected. 2. Answer B. Pneumonia is the most common complication of influenza. It may be either primary influenza viral pneumonia or pneumonia secondary to a bacterial infection. Other complications of influenza include myositis, exacerbation of chronic obstructive pulmonary disease, and Reye’s syndrome. Myocarditis, pericarditis, transverse myelitis, and encephalitis are rare complications of influenza. Although septicemia may arise when any infection becomes overwhelming, it rarely results from influenza. Meningitis and pulmonary edema aren’t associated with influenza. 3. Answer B. Initially, the nurse should plug the opening in the tracheostomy tube for 5 to 20 minutes, and then gradually lengthen this interval according to the client’s respiratory status. A client who doesn’t require continuous mechanical ventilation already is breathing without assistance, at least for short periods; therefore, plugging the opening of the tube for only 15 to 60 seconds wouldn’t be long enough to reveal the client’s true tolerance to the procedure. Plugging the opening for more than 20 minutes would increase the risk of acute respiratory distress because the client requires an adjustment period to start breathing normally. 4. Answer A. As the respiratory center in the brain becomes depressed, hypoxia occurs, producing wheezing, bradycardia, and a decreased respiratory rate. Delirium is a state of mental confusion characterized by disorientation to time and place. Hyperventilation (respiratory rate greater than that metabolically necessary for gas exchange) is marked by an increased respiratory rate or tidal volume, or both. Semiconsciousness is a state of impaired consciousness characterized by limited motor and verbal responses and decreased orientation. 5. Answer D. In respiratory acidosis, ABG analysis reveals an arterial pH below 7.35 and partial pressure of arterial carbon dioxide (PaCO2) above 45 mm Hg. Therefore, the combination of a pH value of 7.25 and a PaCO2 value of 50 mm Hg confirms respiratory acidosis. A pH value of 5.0 with a PaCO2 value of 30 mm Hg indicates respiratory alkalosis. Options B and C represent normal ABG values, reflecting normal gas exchange in the lungs. 6. Answer B. Administration of a corticosteroid such as prednisone suppresses the body’s natural cortisol secretion, which may take weeks or months to normalize after drug discontinuation. Abruptly discontinuing such therapy may cause the serum cortisol level to drop low enough to trigger acute adrenocortical insufficiency. Hyperglycemia, glycosuria, GI bleeding, restlessness, and seizures are common adverse effects of corticosteroid therapy, not its sudden cessation. 7. Answer D. A patent airway and an adequate breathing pattern are the top priority for any client, making impaired gas exchange related to airflow obstruction the most important nursing diagnosis. The other options also may apply to this client but are less important. 8. Answer B. A non-rebreather mask can deliver levels of the fraction of inspired oxygen (FIO2) as high as 100%. Other modes — simple mask, face tent and nasal cannula — deliver lower levels of FIO2. 9. Answer B. The nurse should perform chest physiotherapy at least 2 hours after a meal to reduce the risk of vomiting and aspiration. Performing it immediately before a meal may tire the client and impair the ability to eat. Percussion and vibration, components of chest physiotherapy, may worsen bronchospasms; therefore, the procedure is contraindicated in clients with bronchospasms. Secretions that have mobilized (especially when suction equipment isn’t available) are a contraindication for postural drainage, another component of chest physiotherapy. 10. Answer D. Hypotension, hypothermia, and vasoconstriction may alter pulse oximetry values by reducing arterial blood flow. Likewise, movement of the finger to which the oximeter is applied may interfere with interpretation of SaO2. All of these conditions limit the usefulness of pulse oximetry. Fever, tachypnea, and tachycardia don’t affect pulse oximetry values directly. 11. Answer B. Maintaining a patent airway is the most basic and critical human need. All other interventions are important to the client’s well-being but not as important as having sufficient oxygen to breathe. 12. Answer C. Controlled coughing helps maintain a patent airway by helping to mobilize and remove secretions. A moderate fluid intake (usually 2 L or more daily) and moderate activity help liquefy and mobilize secretions. Bed rest and sedatives may limit the client’s ability to maintain a patent airway, causing a high risk of infection from pooled secretions. 13. Answer A. Tidal volume is the amount of air inspired and expired with each breath. Residual volume is the amount of air remaining in the lungs after forcibly exhaling. Vital capacity is the maximum amount of air that can be moved out of the lungs after maximal inspiration and expiration. Dead-space volume is the amount of air remaining in the upper airways that never reaches the alveoli. In pathologic conditions, dead space may also exist in the lower airways. 14. 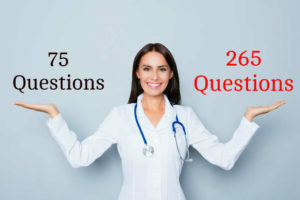 Answer C. An FO2 greater than 0.5 for as little as 16 to 24 hours can be toxic and can lead to decreased gas diffusion and surfactant activity. The ideal oxygen source is room air F IO 2 0.18 to 0.21. 15. Answer B. A positive reaction means the client has been exposed to TB; it isn’t conclusive of the presence of active disease. A positive reaction consists of palpable swelling and induration of 5 to 15 mm. It can be read 48 to 72 hours after the injection. In clients with positive reactions, further studies are usually done to rule out active disease. In immunosuppressed clients, a negative reaction doesn’t exclude the presence of active disease. 16. Answer A. In a client with emphysema, albuterol is used as a bronchodilator. A respiratory rate of 22 breaths/minute indicates that the drug has achieved its therapeutic effect because fewer respirations are required to achieve oxygenation. Albuterol has no effect on pupil reaction or urine output. It may cause a change in the heart rate, but this is an adverse, not therapeutic, effect. 17. Answer B. A pH less than 7.35 is indicative of acidosis; a pH above 7.45 indicates alkalosis. 18. Answer B. Before weaning a client from mechanical ventilation, it’s most important to have baseline ABG levels. During the weaning process, ABG levels will be checked to assess how the client is tolerating the procedure. Other assessment parameters are less critical. Measuring fluid volume intake and output is always important when a client is being mechanically ventilated. Prior attempts at weaning and ECG results are documented on the client’s record, and the nurse can refer to them before the weaning process begins. 19. Answer B. The ABG results reveal respiratory alkalosis. The best intervention to raise the PaCO2 level would be to have the client breathe into a paper bag. All of the other options — such as administering a decongestant, offering fluids frequently, and administering supplemental oxygen — wouldn’t raise the lowered PaCO2 level. 20. Answer C. The most significant and direct indicator of the effectiveness of oxygen therapy is the PaO2 value. Based on the PaO2 value, the nurse may adjust the type of oxygen delivery (cannula, venturi mask, or mechanical ventilator), flow rate, and oxygen percentage. The other options reflect the client’s ventilation status, not oxygenation. 21. Answer A. Endotracheal suctioning removes secretions as well as gases from the airway and lowers the arterial oxygen saturation (SaO2) level. Coughing and incentive spirometry improves oxygenation and should raise or maintain oxygen saturation. Because of superficial vasoconstriction, using a cooling blanket can lower peripheral oxygen saturation readings, but SaO2 levels wouldn’t be affected. 22. Answer A. The nurse should measure and document the amount of chest tube drainage regularly to detect abnormal drainage patterns, such as may occur with a hemorrhage (if excessive) or a blockage (if decreased). Continuous bubbling in the water-seal chamber indicates a leak in the closed chest drainage system, which must be corrected. The nurse should keep the collection chamber below chest level to allow fluids to drain into it. The nurse should not strip chest tubes because doing so may traumatize the tissue or dislodge the tube. 23. Answer B. Conditions that increase oxygen demands include obesity, smoking, exposure to temperature extremes, and stress. A client with chronic bronchitis should drink at least 2,000 ml of fluid daily to thin mucus secretions; restricting fluid intake may be harmful. The nurse should encourage the client to eat a high-protein snack at bedtime because protein digestion produces an amino acid with sedating effects that may ease the insomnia associated with chronic bronchitis. Eating more than three large meals a day may cause fullness, making breathing uncomfortable and difficult; however, it doesn’t increase oxygen demands. To help maintain adequate nutritional intake, the client with chronic bronchitis should eat small, frequent meals (up to six a day). 24. Answer B. Skin color doesn’t affect the mucous membranes. The lips, nail beds, and earlobes are less reliable indicators of cyanosis because they’re affected by skin color. 25. Answer D. The therapeutic serum theophylline concentration ranges from 10 to 20 mcg/ml. Values below 10 mcg/ml aren’t therapeutic. 26. Answer A. To avoid a hypotensive reaction from rapid I.V. administration, the nurse should infuse vancomycin slowly, over 60 to 90 minutes, in a large volume of fluid. Although neutropenia may occur in approximately 5% to 10% of clients receiving vancomycin, this adverse effect reverses rapidly when the drug is discontinued. 27. Answer C. Extreme anxiety may lead to respiratory alkalosis by causing hyperventilation, which results in excessive carbon dioxide (CO2) loss. Other conditions that may set the stage for respiratory alkalosis include fever, heart failure, and injury to the brain’s respiratory center, overventilation with a mechanical ventilator, pulmonary embolism, and early salicylate intoxication. Type 1 diabetes mellitus may lead to diabetic ketoacidosis; the deep, rapid respirations occurring in this disorder (Kussmaul’s respirations) don’t cause excessive CO2 loss. Myasthenia gravis and narcotic overdose suppress the respiratory drive, causing CO2 retention, not CO2 loss; this may lead to respiratory acidosis, not alkalosis. 28. Answer D. The client is hypoxemic because of bronchoconstriction as evidenced by wheezes and a subnormal arterial oxygen saturation level. The client’s greatest need is bronchodilation, which can be accomplished by administering bronchodilators. Albuterol is a beta2 adrenergic agonist, which causes dilation of the bronchioles. It’s given by nebulization or metered-dose inhalation and may be given as often as every 30 to 60 minutes until relief is accomplished. Alprazolam is an anxiolytic and central nervous system depressant, which could suppress the client’s breathing. Propranolol is contraindicated in a client who’s wheezing because it’s a beta2 adrenergic antagonist. Morphine is a respiratory center depressant and is contraindicated in this situation. 29. Answer C. The client with COPD retains carbon dioxide, which inhibits stimulation of breathing by the medullary center in the brain. As a result, low oxygen levels in the blood stimulate respiration, and administering unspecified, unmonitored amounts of oxygen may depress ventilation. To promote adequate gas exchange, the nurse should use a Venturi mask to deliver a specified, controlled amount of oxygen consistently and accurately. Drinking three glasses of fluid daily wouldn’t affect gas exchange or be sufficient to liquefy secretions, which are common in COPD. Clients with COPD and respiratory distress should be placed in high Fowler’s position and shouldn’t receive sedatives or other drugs that may further depress the respiratory center. Very helpful to study and to review ,thanks.